Rama spends 11 long and uneventful years at Ayodhya in peaceful company of his wife Seetha before King Dasaratha decides to coronate him as the next king of Kosala. This marks the beginning of Ayodhya Kanda or the Canto on Ayodhya in Valmiki and Kamaban’s literatures. 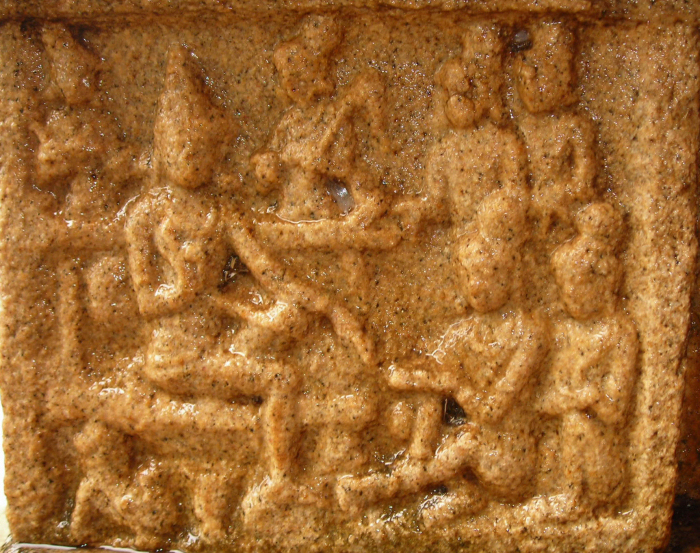 At Pullamangai, the decision of King Dasaratha to coronate Rama as his successor is sculpted in a panel [No. 29] in the North Eastern Karna segment of the Mandapa abutting the Vimana. The theme of this panel is further confirmed by the next panel [No. 30], which is a definitive representation of the coronation ceremony. This royal consultation scene is singular, not seen elsewhere in early Chola temples. Also, this is the very first time King Dasaratha is shown in his royal court at Pullamangai; all of his earlier representations were at his household [Anthappuram]. Location: North wall of the Mandapa, adjacent to the Vimana. Panel Segment: Vedipada in the Karna segment, facing West. Placement: Not significant. Invisible to the spectator standing in front of Karna. Theme: Consultation at the royal Court. The panel is in good condition and can be studied well. There are eight human characters in this panel, out of which one is most dominant and the rest are supporting cast. The most dominant character is a male figure firmly seated in a large royal chair [Simhasana]. Around 2/3 of the panel space has been allocated to portray this figure and the royal chair in which he is seated; this underlines the paramount importance of this character in the portrayed theme. The dimensions of the chair and its backrest are noteworthy. An earlier panel at Pullamangai (King Janaka’s meeting with Sage Viswamitra) portrays a similar chair but its dimensions and importance are not this significant. A large vessel is seen right below the chair. The figure’s legs are held in an indefinite posture that can be placed between Utkutiasana and Sukhasana. He is wearing a band [Yogappatta] in his left leg. His right foot is resting on a footstool. His back is firmly held straight in erect position – denoting his mood and resolve to convey something definitive. He is wearing Karanta Makuta, Patra Kundala and neck ornaments. His right hand is raised, showing Kataka Mudra. This once again represents his attempt to convey some definitive decision.His left elbow is casually held over his left knee. Two chauri bearers are seen on either sides of this figure, behind the royal Chair. A goblin like figure is seen right below the Simhasana near the copper vessel; this figure is eroded and is not visible in its entirety. Two figures are seated in front of the king, on the floor, the first one being more significant that the second. This male figure is clad in Jatamakuta and is wearing Patra Kundalas and necklaces. His right hand is holding the lower part of his left leg while the left hand is raised in Pataka posture. Clearly this character is in active conversation with the seated male though he is not looking at the latter face to face. His head is slightly bent down as a mark of respect. The conversation portrayed in this panel is in striking contrast to another one seen in an earlier panel at Pullamangai [Sage Viswamitra at King Janaka’s Court]. Clearly the artisans effectively make use of character’s gestures and postures to indicate the class difference and the mood of the characters as well as the nature of conversation taking place. The second seated male figure is sitting very close to the first one, suggesting intimacy. His right hand is held in his cheeks while the left is resting on his knee. He is actively listening to the conversation – not participating. He is much more submissive than the figure in the front. Two other male figures are seen in the background, far behind the first two. Among them, the first one is participating in the conversation as seen by his hand gesture which is another variant of Pataka. The second one is supporting him, standing close to him. These figures are looking straight into King’s face and talking; thus their posture is not as submissive as the front figures. The Pataka of the first does not seem to represent acceptance; rather it is suggesting an alternative viewpoint to what is proposed by the main figure. The distance between the king and these figures suggest less intimacy; their size reduce their relative importance in the panel. It is tempting to identify the figure seated in the Simhasana with King Dasaratha. The context and placement of the panel support this identification. The relative importance of the character, the asana in which he is seated and the chauri bearers in the background supplement this identification. At Pullamangai it is a norm to portray the king only with chauri bearers in the background. This norm is not seen elsewhere in any other early Chola Ramayana narrative. However there are two challenges. First, it is generally not a norm to portray Kings with Karanda Makuta; Kreeta Makutas are more common. Second, a more complex one, is the presence of Yogappatta which is specifically highlighted in the figure’s left leg. This identifies the person as a Yogi. Looking for references for Dasaratha as a yogi in literatures, we come across one complete Padalam of Kambar [Mandira Padalam] dealing with the Mantralosana [royal consultation] at the court regarding the King’s desire to renounce the kingship to undertake penance and coronate Rama as the next King of Ayodhya. The indention is clearly spelt out in Song No.30. யாதுநும் கருத்து?' என இனைய கூறினான். However none of the songs in this Padalam provide any references to Dasaratha wearing a Yogappatta during or after the consultation. If the proposed identity of Dasaratha is accepted, then the Yogappatta should be treated as yet another indigenous version of Chola Ramayana at Pullamangai. The two male figures seated in front of Dasaratha could be Rama-Lakshmana. The intimacy between the two, the Jatamakuta, and the respectful confidence shown by the first male figure – all support this identification. While King’s Kataka Mudra signifies his resolution to renounce, Rama’s submissive Pataka might denote acceptance. This is the only panel across all Chola Ramayana narratives to portray an adult grownup Rama as one seated in front of his father. The background figures might represent Bharatha and Shatrugna or Courtiers. If the former identity is accepted, then the farther distance between Rama-Lakshmana and Bharata-Shatrugna assumes further significance. It seems the King is having intimate consultation with his four sons and sharing his resolution to renounce the kingdom. The overall significance of this panel, in the context of Chola Ramayana representations is worth pondering about. If the artisans simply wanted to imply Rama’s coronation, they could have proceeded to the next panel [No.30] easily. Spectators would have understood the implied decision of the king. However, by explicitly dedicating a panel to represent the consultation, the sculptors seem to highlight the fact that the decision of Dasaratha to renounce the kingdom was significant and was well discussed and consulted. It is noteworthy that Tiruchennampoondi narrative also dedicates two panels to cover Dasaratha’s mood before coronation and the coronation itself; however here the King is in happy company of his queen. The royal consultation is absent.